Thai Singapore movie Pop Aye / ป๊อบอาย มายเฟรนด์ was released in year 2017 and lasts 1h42mn. A middle age architect, called Thana, sees his work, i.e. a building built 30 years ago about to be destroyed and to be replaced by a new one. He sees his love with his wife becoming indifference. He is facing middle age crisis. 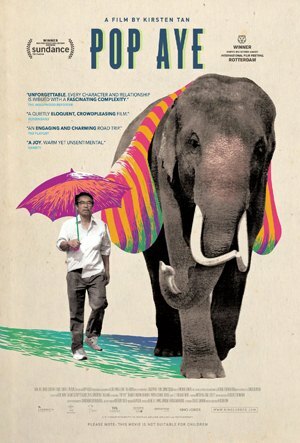 Thana sees an elephant wandering in Bangkok. Back to office, he understands he is put on the side by his young boss and his advice has no longer importance. Seeing again elephant Popeye, that he first met 50 years ago, Thana decides to buy it and bring it back to Loei. On the way, he meets a weird man, called Dee, living in an abandoned petrol station and waiting for death. Dee joins the architect Thana on his journey to Loei. The weird man has a wish, i.e. to go on a motorbike ride with his girlfriend Ja. Meanwhile, the elephant flees, and the police starts to be involved. Police captures Thana and his elephant. Police needs to bring them to an animal detention center, but it is far away. As Thana gets fainted, they stop in a bar being along the road. An old lady boy keeps talking to Thana and reminds him that nothing lasts forever. Finally, as Thana is not showing indifference to the lady boy, this one helps him to get the key locks and he can flee with his elephant. Dee has a deadly accident with a motorbike he bought thanks to Thana's money. Thana is about to reach Loei. He finally meets Ja, who is now married. Ja is reluctant to accept Dee’s ashes as they haven't met for twenty years. As she is good hearted, she finally takes the ashes on a motorcycle trip around the village and so accomplishes Dee’s last wish. Thana meets his uncle Piek, who sold the family land, to get a condo inside the complex. He blames his uncle to have sold family assets but himself he sold Popeye many years ago to go to Bangkok! Finally, Thana is back to Bangkok and visits with his wife a last time the building going to be destroyed. She recalls how proud she was when it was built. A new blood in their relationship can start following this journey.